Blog - How To Save Money On Your Canvas Frames? How To Save Money On Your Canvas Frames? If you are running a canvas printing store, you need to make sure that you have the right canvas printing supplies because the quality of your canvas prints depend a great deal on the quality of your canvas rolls and your canvas frames. Many a times canvas printing companies in an effort to keep their canvas printing costs low, go for cheap canvas frames and canvas rolls. This lead to substandard canvas prints and little do they realize that it will affect their reputation very badly leading to loss of business. You just need to make sure that you get your canvas frames and other canvas printing supplies at the right price so that you do not compromise on the quality of your products. Here are few tips on how you can save money on your canvas frames. 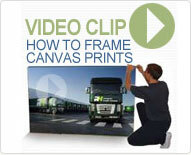 First you need to make a complete survey of all the leading suppliers who sell canvas frames at wholesale prices. In your search you may come across many suppliers who promise to sell you canvas frames at a very cheap price. Until you compare their prices you will not know the cheapest supplier. However you will have to make sure that the supplier you choose not only sells your canvas frames at the cheapest price or at whole sale price, the products that you receive should also be of good quality. There are also other factors such as timely delivery, consistency in the quality of the products supplied etc. Many suppliers will provide you with volume discount. So you need to plan your order carefully so that you can make bulk orders and take advantage of the volume discount. You must have a preferred supplier to order your canvas frames regularly so that you can get your canvas frames at a good price. This will also save you a considerable amount of time as you will not have to worry about searching for a new provider every time you are in need of canvas printing supplies. Moreover, when you make bulk orders, you will be able to save on the shipping rather than making several small sized orders. You must also look for suppliers who offer you special discounts and offers. Look for suppliers who do not levy any hidden charges otherwise you will be in for surprises when you get your bill. It also helps when you can order your canvas frames online as you don’t have to waste your productive time in driving in heavy traffic. Though these are very basic tips, you can certainly save a considerable amount of money by following these tips. You don’t have to go for cheap quality canvas frames but get premium quality canvas at a low price. We bring to you the best canvas frames available in the market at the lowest prices possible.